Luxury Catamaran Encore - up to 15% off on 2009 inquiries. 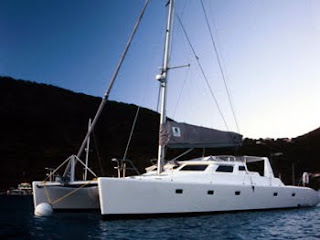 We are offering up to 15% on 2009 inquiries to charter the luxury catamaran Encore. Encore features all the latest enhancements with a flat screen TV, air conditioning, a hard top bimini, level flooring from the cockpit through to the saloon area which offers teak flooring and a cool blue interior. The large bathing platform makes access in and out of the water safe and comfortable for all water sports with easy movement from the cockpit with the walk through opening through to the bathing platform. Encore has ample headroom (7 Ft) throughout and boasts a large saloon area with panoramic views that can be enjoyed when seated at the bar, whether you are enjoying a drink on anchor or while under way. The dining/saloon area is on the same level as the hi-tech Galley. From this airy and spacious area, the large double sliding doors lead you onto the shaded cockpit. Enjoy space and comfort with a high standard of sailing performance from the multiple award winning catamaran. Each cabin offers Queen Size beds with en suite facilities, air conditioning and personal CD players. We are offering up to 15% off 2009 inquiries. Kids go free,(restrictions apply, call for details). 10 nights for the price 7(Not applicable for Christmas and New Years).